In Messengers of the Right: Conservative Media and the Transformation of American Politics, Nicole Hemmer argues that broadcasters like Glenn Beck, Rush Limbaugh and Sean Hannity are but the second generation of conservative media activists. Americans, states Hemmer, are used to thinking of such figures as being integral to contemporary conservatism; her book tells the story of the lesser-known first generation. Katherine Williams recommends this text to readers interested in social history, media studies and US politics. Messengers of the Right: Conservative Media and the Transformation of American Politics. Nicole Hemmer. University of Pennsylvania Press. 2016. 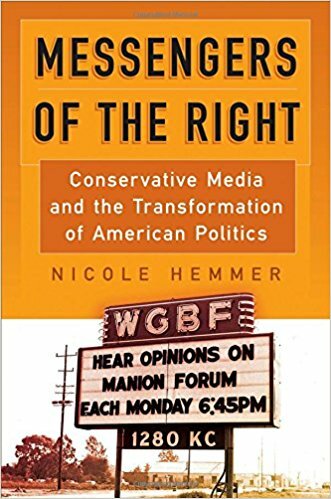 Despite the common belief that conservative media activism gained traction in the 1960s in the USA, in Messengers of the Right: Conservative Media and the Transformation of American Politics author Nicole Hemmer shows how the conservative media movement, as we know it today, found its origins in the 1940s. Messengers of the Right follows three activists from the 1940s to the early 1980s: broadcaster Clarence Manion, book publisher Henry Regnery and magazine publisher William Rusher. All three men had previously worked in politics in some form or other: Manion had been fired by President Dwight D. Eisenhower in 1954 due to his support of the Bricker Amendment, an anti-interventionist policy designed to keep America isolated from world events. He would go on to host the Manion Forum, first on radio, and then on television. Regnery founded his own publishing house in 1947 after breaking with Human Events, a conservative news publication. Believing that the Republican administration was not taking the battle against communism seriously enough, Rusher abandoned mainstream politics to become the publisher of the National Review in the late 1950s. cultivated what we can usefully think of an ‘’elite populism’’, which allowed media activists to speak as representatives of an oppressed minority […] despite their access to traditional sources of economic, social, and political power. Arguably, contemporary conservative media news outlets have continued this tradition, such as through claiming that white people are the truly oppressed group in American society. As an article in The Independent reports, forums such as Fox News are instrumental in presenting white racial grievances as central to modern-day conservatism, and also notes that during Barack Obama’s presidency in particular, any government policy could be, and was, reimagined as an attempt to further oppress white people. Messengers of the Right is comprised of four principal parts: 1). ‘Networks’; 2). ‘Leaders’; 3). ‘Elections’; and 4). ‘Adaptation’. For the purposes of this short review, I will focus on Chapter One, ‘The Outsiders’, and Chapter Nine, ‘The Pivot’. Chapter One gives readers valuable insight into the lives of Manion, Regnery and Rushner, and Chapter Nine illustrates the tenacity of the movement, despite its many setbacks. In order to understand the political perspectives and ‘intellectual odysseys’ of conservative media activists like Manion, Regnery and Rusher, it is crucial to cast an eye back further to the days of the Populists, a grassroots political party that entered party politics in 1890. The Populists were primarily comprised of disenfranchised farmers who campaigned for economic reform; their central argument was that the producing classes toiled to collect or make the raw materials needed for industry, yet were ignored and isolated by urban elites. In Chapter One, Hemmer gives us a brief overview of the lasting influences of the Populists, particularly their use of print media to disseminate campaign literature and advance the goals of their movement. With no support from established media outlets, the Populists printed their own papers, contributing to a ‘vibrant tradition’ in US journalism. This influence would be felt in later years when conservative media activists founded their own outlets. Manion, born in 1896, therefore came into the world at a time of profound political change: Republican candidate William McKinley had defeated Democrat (and Populist Party nominee) William Jennings Bryan in a dramatic US presidential race. The election marked the beginning of the Third Party System, a period of American history dominated by the Republicans. The latter stage of this period is often known as the ‘Gilded Age’: a term derived from Mark Twain’s co-authored novel The Gilded Age: A Tale of Today (1873) which satirises the excesses of an era when extreme poverty was a reality for the majority of Americans. Having enjoyed a career in and out of politics throughout the 1930s and 1940s, Manion was appointed chair for the Commission on Intergovernmental Relations (CIR) that had been set up to investigate the output of federal programmes. Regnery, born in 1912, also came of age in the brief period of Republican dominance. After returning to the US in 1936 after studying economics at the University of Bonn, he worked briefly in the Resettlement Agency, but soon became disillusioned. His enthusiasm for Franklin D. Roosevelt’s New Deal – which sought to improve the socioeconomic circumstances of low-income Americans through relief, recovery and reform – waned when he came to see first-hand the poor organisation and administration of such schemes. Rusher, born in 1923, also came to be an opponent of the New Deal, despite the influence of his socialist grandfather. Rusher was a student at Princeton University when the US entered World War II and, unlike his counterparts, supported interventionism. Rusher became aligned with conservatism during the 1950s, when he found himself frustrated with Eisenhower’s lack of support for anti-communist senator Joseph McCarthy. All three men lived and worked during periods of intense political and economic upheaval. America’s emergence onto the world stage as a global superpower following World War II left many questioning the political mainstream. Despite the focus on Manion, Regnery and Rusher, Hemmer notes that conservative media activism was ultimately a group effort: activists came together in the shared belief that the media was the key to shaping public opinion, and subsequently the political landscape of America. Their ventures, both joint and individual, included the aforementioned Human Events, Regnery Publishing, the Manion Forum and National Review, to name but a few. As these were in large part self-financed or dependent upon the generosity of private donors, such ventures initially had an extremely small readership, and arguably had little wider impact until the 1960s. In Chapter Nine, ‘The Pivot’, the author discusses the 1964 presidential election in which the Republican candidate Barry Goldwater lost to Lyndon B. Johnson. 26 million people voted for Goldwater; this was seen by many as representing a solid conservative base. However, many conservative media activists came to realise that the time of preaching to the converted was over: they needed to attract a new audience. In order to secure a Republican victory in the future, conservative media activists needed to portray themselves as the ‘oppressed majority’. To gain the support of the ‘uncommitted’ following Goldwater’s defeat in 1964, conservative media activists sought new means of disseminating their message. At this point, the income of Manion’s Forum had shrunk by 16 per cent, and Regnery’s publishing house was accumulating stacks of unsold paperbacks. Television would present new opportunities for these activists, heralded as ‘an indispensable part of evangelisation’. Manion began his conservative talk show Firing Line in 1966. However, television was an expensive medium, and many major networks were not on board with the conservative message. Despite the Goldwater loss in 1964, the election of Richard Nixon in 1968 came to represent a victory for conservative media activists. It was the first time since WWII that a candidate backed by conservative media has won an election, and it also marked another first: a presidential candidate who had openly lobbied for the support of conservative media outlets. In a bid to woo conservative voters prior to the 1968 election, Nixon focused his energies on the National Review and Human Events in particular, believing their contributors represented the real source of power within the conservative media movement; Regnery Publishing however, was not entirely convinced that Nixon was the ideal conservative candidate. Nonetheless, Nixon’s election presented conservative media activists with an ‘unprecedented opportunity’: the outsiders had finally come in from the cold. From their humble beginnings in private publishing, conservative media activists had secured the support of the President; whether Nixon would ultimately benefit their cause, given his oft-questioned commitment to ‘true’ conservatism, remained to be seen, but compromises had to be made by both parties in order to influence the wider political landscape. The medium is the message, as they say, and contemporary conservative TV shows in particular attract massive audiences. The notion of the ‘oppressed majority’ is one which has been used in attempts to delegitimise political leaders or events conservative commentators believe are profoundly opposed to their fundamental values. Much of this rhetoric is centred on deliberately inflaming racial tensions: for instance, Barack Obama was accused of having a ‘deep-seated hatred of white people’ by Fox News presenter Glenn Beck. This clip has been viewed over 55 thousand times on YouTube, and Fox News, as of May 2017, remains the most-watched cable TV show in America. First published 61 years ago, National Review is available today both digitally and in print, and remains popular amongst conservative readers. Hemmer – who was present during recent events in Charlottesville, and wrote an insightful and thoughtful piece on the violence that unfurled in her hometown – has here written a nuanced and well-researched account of the origins of the contemporary conservative media movement. Messengers of the Right provides a clear insight into the prevailing social issues of the time, and the influences that persuaded those such as Manion, Regnery and Rusher to abandon mainstream politics and become political outsiders, fighting for a cause that, for many years, appeared to lack any mass public support. That is certainly not the case today, and in light of recent events, we can only wonder what the future holds for what has become mainstream conservatism. Katherine Williams is an ESRC-funded PhD candidate at Cardiff University. Her research interests include the role of women in far-right groups, feminist methodologies and political theory, and gender in IR. You can follow her on Twitter: @phdkat. Read more by Katherine Williams.